By shifting their current perceptions of sustainability, companies can re-inspire employees (who are hungry for change) to play their part in bridging the gap between business value and societal needs. If they succeed, they could emerge from this crisis as trusted and sustainable 21st century brands. In order to capture this opportunity, companies need to build a business culture that truly embraces sustainability and innovation. This is not about “greening” an employee base or organizing one-off community days. Nor is it about setting a target to reduce a carbon footprint or viewing sustainability in the narrow environmental sense. It is about building a cultural ethos that understands and embraces all the dimensions of sustainability -- planet, community, people, business and brands –- and the interactions between them. A survey of companies with reputations for nurturing best-in-class cultures of sustainability such as Timberland, Seventh Generation, Eileen Fisher, Patagonia and Stonyfield Farm, as well as less niche (and nimble) multinationals like Nike, Wal-Mart and the leading British retailer Marks & Spencer’s which are staying relevant by transforming their old business mindset, reveals some common principles that permeate entire companies in ways that permits employees to experience and view sustainability as an integral part of everything they do and how they do it. So, what are these sustainable companies doing right? Put another way, what are they doing differently? Even if the CSR nomenclature still lingers in specific shareholder reports, these sustainable companies do not view sustainability as a responsibility, as “risk and reputation management” or as a reporting requirement. Rather, they embrace it as a (if not the) source of innovation for a better and more profitable company. Eileen Fisher actually uses the term “Corporate Consciousness,” and Unilever istransitioning to “Corporate Social Vitality.” Both terms signal that sustainability should be the source of energy, experimentation and inspiration that fuels a company’s growth and culture. Sustainable companies are also generally opposed to having a separate CSR department –- a move that can signal to employees that responsibility for sustainability is limited to the job of the designated and knowledgeable few. Sustainable companies are committed to enabling their employees to change the way they think about things towards a new culture of systems thinking where everything is connected. This perspective allows employees to see not just their organization as a larger whole (instead of compartmentalized departments) but it also empowers them to develop an innate understanding of how their company is interconnected with the world around them. For example, Wal-Mart recognized that about 90 percent of its environmental impacts occur deep within their supply chain. To address the inefficiencies at the root, Wal-Mart formed networks across formerly disparate business units from buildings to fleet, to waste to packaging, to food and agriculture. This example helps train employees to address systemic barriers to sustainability that are interconnected. Sustainable businesses require a whole new level and type of engagement with local communities and governments, non-profits and even (at times) competitors. To support this collaborative “open source” way of working, employees should be given new channels of knowledge-interchange and encouraged to open up best-practices and learning to the rest of the industry. This often requires repeated reassurance that competitors will eventually share back and that it is in the company’s longer term interests to get the whole industry designing better products and services as a whole. For example, M&S has started the “M&S Supplier Exchange,” which is used to share best practices, stimulate innovation and even to help suppliers secure the funds needed to develop more sustainable production methods. As Jeffrey Hollender, CEO of Seventh Generation recently noted, “It starts with how you answer the phone, how you treat the people who clean the office…these are the easy things we can do.” A culture of respect helps imbue employees with a holistic approach to business, environment and society. From the very first interview until the exit interview, sustainable companies continuously reinforce the need for all employees to be responsible and accountable for sustainability, and to view their efforts in a larger company context. For example, Timberland's “Path of Service” program allows employees 40 hours of annual paid time off to work on service projects in communities. Though practical goals are important, it is also important to set goals that raise the bar for sustainability in business. For example, Nike has set its ‘North Star’ as “becoming a totally ‘closed loop’ company where materials from a Nike shoe, for example, will end up becoming the materials for a Nike shirt.” Imagining this as the end result shows employees that their steps along the way are positive progress on an ultimate journey toward ideal sustainability, and encourages constant innovation rather than resting on the laurels of previous accomplishments. Sustainable companies make transparency work for them by involving their employees, shareholders and customers in the process of exposing and solving problems. This wider community helps by asking questions, challenging assumptions and devising solutions. In summary, we are in an acute time of change where the wider business community is just beginning to realize the extent to which the health of a company’s core values, beliefs and traditions (i.e. its culture) affects the health of their long-term ability to sustain a healthy business on all fronts. The change represents an opportunity to embrace “enlightened capitalism” and revitalize companies with a new type of connected corporate consciousness: a consciousness that helps businesses to consistently create value by consistently competing on the values of sustainability and innovation. Rachel Botsman specializes in the intersection between brand, innovation and sustainability. She is Director of Strategy for OZOlab, a leading sustainable and innovation think tank and business incubator. She can be reached at Rachel@ozolab.com. Neil Fraser, a software engineer at Google, took 9 carefully selected cross sections from a MRI scan and glued them on wooden blocks to create a 3D representative model [fraser.name]. 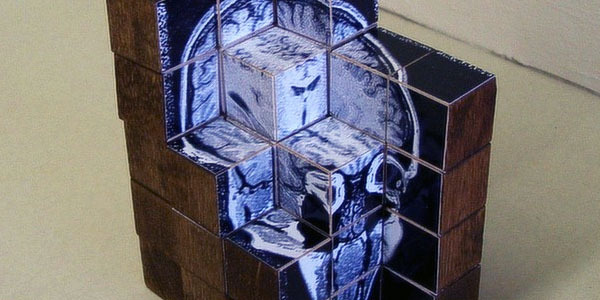 The result is a collection of 60 1-inch cubes, of wich 94 outside faces are simply varnished, and 266 internal faces feature a square slice of the MRI images. One can then "dig" into the brain to carve out custom shapes. Using touch as well as the third dimension to explore 3D data is an interesting avenue, as alternative interfaces need to be explored as much as representation. Martin Ouellette is President and Creative Director of Provokat, one of Canada's leading digital adveritsing agencies. For him, infoviz is more than a simple discipline, it's a culture phenomenon. "I’ve had 4 people confront me because I stopped following them and Qwitter told them. All 4 of those people were pissed off at me for it. 3 of them had stopped following me to get even. The one who didn’t, well he didn’t follow me to begin with but was still angry, yet in the e-mail he sent me he noted that he didn’t know who I was. The truth is I didn’t know who he was either, don’t remember following him, don’t recall anything he’d ever tweeted about and can only assume I added him by accident at one point when following a reply thread. Qwitter caused negative drama between two people who don’t know each other, have had no interaction, and really no reason for any bad feelings." Les nouvelles relations sociales sont, finalement, assez burlesques! Through the Digital Archive Project, selections from the League's archive of more than six hundred audio/video recordings are being digitized and made available for online audiences. This week, the League launches Revisiting Postmodernism, a curated podcast series of original audio recordings from the early and mid-1980s. The series includes presentations by leading theorists and practitioners of postmodernism, including John Burgee, Michael Graves, Charles Jencks, Charles Moore, James Stirling, and others. New presentations will be available once a week over the next several weeks and will be announced via @theLeague, the League's weekly e-newsletter. For more information about the complete series, click here. To have new episodes of Revisiting Postmodernism automatically downloaded to your computer or mp3 player, subscribe to the League's podcast series on iTunes. Search for "Architectural League" in the iTunes Store and follow the instructions for how to subscribe.